I expected rain today, so I dressed in my full length suit and new wellies, but it hardly rained at all! Another nice day in the West - despite a forecast for a very wet day, I was very lucky to avoid the showers that were around. I was in Achill for a lot of the day and I know from the past that it can have its own micro-climate, when compared with the rest of the country. So a very pleasant day - tomorrow looks good too. My thanks to Dorothy and crew for putting me up last evening in Rosmindle. I also called to my brother-in-law Bryan's house to say "hello" to Maria and her Mum Gemma. My first port of call today was to O'Donnell's Pharmacy in Westport to get an extra memory card for my camera. This is the height of the holiday season in Westport, and even though it was quite early in the morning, the town was already busy. 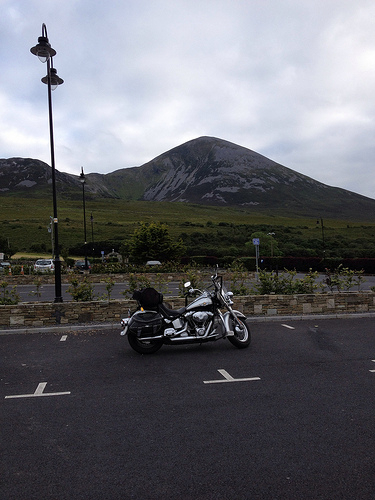 Yesterday evening on my ride into Westport I stopped at Croagh Patrick, which I have climbed before, and took the photo to the left. Leaving Westport I headed for Newport. On the way I came up behind a slow moving jeep, but on the twisty section of road I had to wait for an opportunity to pass. Very soon we came upon some temporary traffic lights , and I moved to the front ahead of the jeep (as I do every day in Dublin). Did the driver like that? Even though I sped away, the jeep came up behind me and passed me out - a little "victory" for the driver. What do you know - within a mile or so we came upon another set of lights, and I moved to the front again. He gave up - little "victory" for me! I could write a book about the driving habits of Irish people. 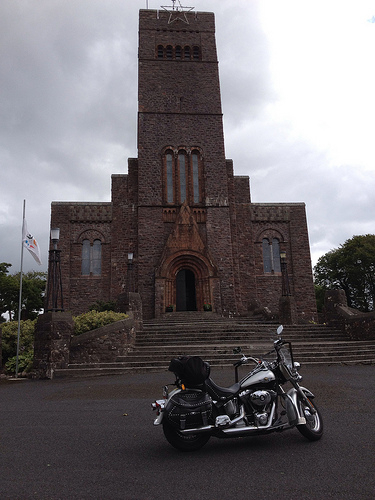 In Newport I called to the church where Roma and I were married on 13th September, 1986. Happy memories. After Newport I headed towards Achill. I stopped at Burrishoole Abbey and Castle - lovely sites. In Mulraney I stopped at the hotel and looked at the back where there are the remains on an old railway station. 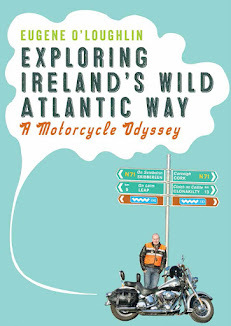 It is now a stop off point on the very popular Greenway cycle track, which follows the old Westport to Achill Sound railway. I took the Atlantic drive around Corraun, stopping off at a small memorial to the Spanish Armada. I was in the Gaeltacht again here and I wondered what tourists would make of all the "Go Mall" signs in Irish. I'm sure that Americans wonder who "Mall" is, and why the locals are encouraging him to "Go" all the time! Coming into Achill Sound you go over a unique bridge after which I headed for a second Atlantic Drive. This is one of the most beautiful coastal drives in the country - even better on a windy day with the sea splashing up on the rocks. 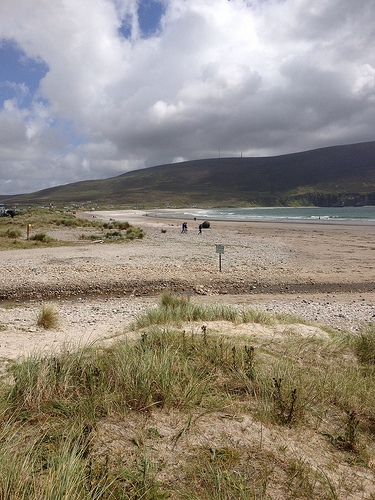 At the end of Achill is Keem Bay and Croghaun mountain - a fantastic approach road with thrilling bends and roads to get down to the beach. After Keem I called on Roma's cousin Mark where he and his wife Antoinette treated me to tea and sandwiches - delicious! I also called on Roma's Uncle and Aunt - Aodhan and Nuala for a few minutes. After all this socialising, it was getting late, so I decided that it was time to leave Achill - the photo below was taken at Keel Beach. 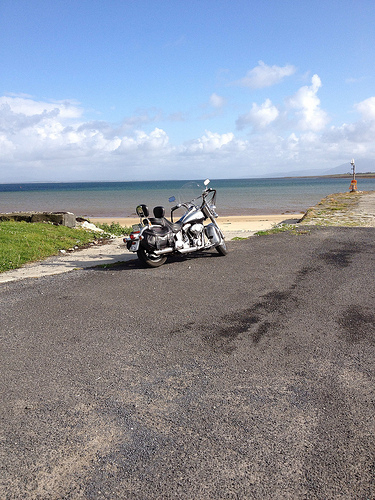 The road from Mulranny to Bangor and on to Belmulllet is great to ride in that it is very straight. This region is almost uninhabited - which made a welcome change from the bungalow blitz that I have seen around the coast of Ireland so far. Arriving in Belmullet at around 5.30 I decided to arrange accomodation before continuing. Two weddings in town meant that everywhere was booked out, but one B&B lady arranged a room for me with her neighbour. The bathroom is not ensuite, which makes me a little uncomfortable. Once organized - I headed down to Blacksod Point where there is a disused weather station. On D-Day in 1944 it transmitted the weather forecast to the British in preparation for the invasion of Normany - neutral or what? The Erris Peninsula is beautiful - very flat with wonderful views out to uninhabited islands. I could also see across to the back of Slievemore and Croghaun in Achill. I have landed in the Talbot Hotel on main street Belmullet for a smashing fish and chips dinner and a glass of wine - plus of course free WiFi. I certainly recommend the food here - very helpful and nice staff. I chatted to some local people at the bar who sang the praises of this area - on a beautiful evening in Belmullet, I think they are right. That first sentence epitomises how I've been all summer! Always dressed for the wrong weather!! Looks like you had a lovely time in a lovely part of Ireland!